I was unsure whether I wanted to write this post, but you know what? I need to vent. I am not one to complain about anyone's parenting skills. EVER. In fact, it's one of those taboo topics I tend to stay far away from. I've removed myself from conversations many, many times because I know how they turn out. Trust me, I've seen some pretty nasty arguments go down in my time. Feelings hurt, friendships ruined, hair extensions pulled. Awful. Bottom line is: No one knows your child like YOU do. No one. Some like to think they do, but they don't. I'm of the opinion that you should do what you need to do to get you through your day. If you want to give your child Pop Tarts and candy corn for breakfast, do it. If you want send your kids to your parents all weekend so you can have alone time, hey, more power to you. The way I see it - if your child is tucked in bed, sound asleep at the end of the day, you've done a brilliant job and deserve a huge pat on the back. And a nice glass of wine. Chocolate certainly doesn't hurt either. I work with children on a daily basis for a living. (Aside from my full time job as a Mom, I do have an actual paying job, but being the boss definitely has its perks). My guard is always up when it comes to kids in general, whether I'm getting paid for it or not. It's just how I am and how I've always been. When I head to the park with my brood in tow, nothing pisses me off more than those moms that give me the once (and twice) over, watching my every move, and let's face it, secretly judging me, despite the fact I'm hovering over each of my kids like a human shield and running around the park like a chicken with its head cut off. Trust me, I can handle them. Just because you may not doesn't give you the right to make snarky comments. And FYI - if you think I don't know you're talking about me, I do, so feel free to use your ladyballs and say what you need to out loud. I've heard it all before. Yet, these are the same moms that converse with each other over their famous coffee chain travel mugs, chatting about whatever or whomever, obsessed with checking their phones every 30 seconds, are neglecting to see Junior throwing fistfuls of wood chips at another child's face and Princess climbing up the WAY-too-big-for-her twisty ladder stairs to the top of the slide, thisclose to falling and getting seriously hurt. Look, all parents are guilty of doing things they shouldn't be while watching their kids, good Lord, even me, but when I'm chasing after someone else's child before they step off the sidewalk and right into traffic because Mom is too busy talking about the awful outfit Kate had on over the weekend at Melissa's jewelry party, and mainly because I cannot BEAR the thought of something horrific happening to an innocent child, please don't have have a go at me because I picked them up and put them back into safe territory. I get you're frustrated and embarrassed that someone had to tell you that you're basically not watching your child, but screaming, "If you touch my child again, I'll report you!" is a bit extreme. Sorry love, but if it wasn't for me, you could have had a very serious situation on your hands. I get you need to have some grown-up time with other adults, trust me, I absolutely, positively do, oh, I do, but c'mon. Give a sister a break, will ya? Watch your child and I wouldn't have to. Oh, and kudos to your friend for apologizing for YOUR behaviour. I'm stepping off my soapbox now. I just needed to vent. Thanks for listening. And I need you to check out this awesome cake. This recipe was actually derived and modified from my Grandma. It came from her Mom's best friend's aunt's cousin's sister, twice removed or something like that. The fun part about it was translating the instructions such as: 2 teacups of flour and a little bit or 1 cup oleo. My personal favourite was 1 teacup molasses with 2 tablespoons and a finger lick (???) taken out. Preheat oven to 350º. Prepare an 9-inch square or round baking pan OR a bundt pan by spraying with a non-stick coating spray (preferably one with added flour to it). In a mixing bowl, whisk together flour, baking soda, salt, cinnamon, ginger, and nutmeg; set aside. In a separate mixing bowl, beat sugars, molasses, eggs, and oil together using an electric mixer. Slowly incorporate dry ingredients along with hot water and mix well. Pour into prepared baking pan and bake for 35-40 minutes or until toothpick inserted into center comes out clean. Remove from oven and allow cake to cool completely. Place 6 egg yolks into a dish along with cornstarch and sugar; lightly whisk and set aside. In a medium saucepan over medium-low heat, bring milk to a simmer, but do not allow to boil. Remove from heat and VERY SLOWLY pour a bit of hot milk over eggs while whisking to temper eggs. If you add the milk too quickly, you'll end up with scrambled, chunky yolks. Not good. Once all the milk is incorporated into yolks and smooth, pour egg mixture back into saucepan and cook over low heat, allowing mixture to thicken. Add rum and vanilla. When done, the sauce will coat the back of a spoon. Place in a glass dish and allow to come to room temperature. Place in refrigerator for a couple hours until well chilled. Pour over slices of cake. Top with walnuts, if desired. NOTE: This cake is AMAZING when wrapped in cling film for a couple days. 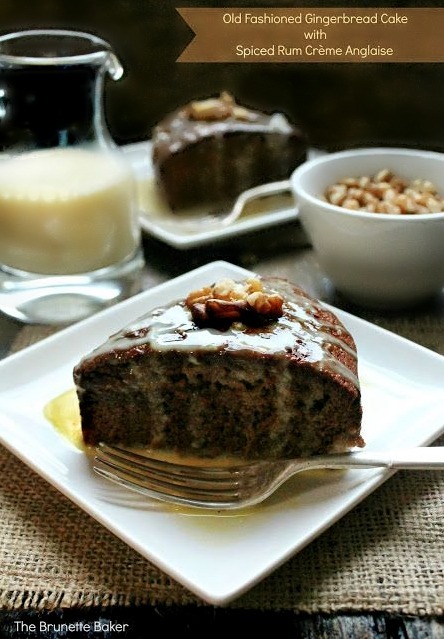 It allows the molasses to really work its magic, making it sticky, moist, and oh, so delicious. Ohmygosh, my heart rate is going up just reading this. Are you kidding me?? Pretty unbelievable story. She obviously needed more cake like this. Gorgeous! God that cake looks amazing. And unfortunately a lot of these Moms love to take their kids out in public because they know that it is an almost guarantee that some else who cares will watch their kid for them because they are too busy being social mom, and not responsible mom. Be proud of the fact that the kids you do connect with will take something special from having been in your company. I don't even know what to say about that mom, but obviously she should have been THANKING you not yelling at you! I love busting out the molasses this time of year! YAY! Cake looks delish! I'm pinning to try it later. And that mom? Probably was completely embarrassed that she was failing on her mom job and just had to lash out. But thank God you were there because it sounds like you prevented an accident. Stopping by from Tasty Tuesday. as a babysitter....I so relate. omg do I relate. I feel you. At least there's gingerbread. This is so pretty and looks so yummy and makes me excited for Christmas! I could never resist an old fashioned gingerbread but your version with crème Anglais looks even more irresistible. Can I assume it's 1 1/2 tsp. of baking soda (not cups!)? Searching the web for a good gingerbread bundt cake! This seems to be the rave! Never made Creme Anglaise but there's a first time for everything! It's just my 2 boys and husband (my worst critics) but...either they like it or they don't, too bad, it's my choice for dessert this Christmas!